— BugsInTheNews is a VIEWER-PARTICIPANT WEBSITE. This article by Jerry Cates, Margaret Archer, and Darryl Archer, first published on 10 September 2011, was last revised on 8 July 2012. © Bugsinthenews Vol. 12:09(2). “Describe the snake,” I told him. “Can you make out two fang marks?” I asked. 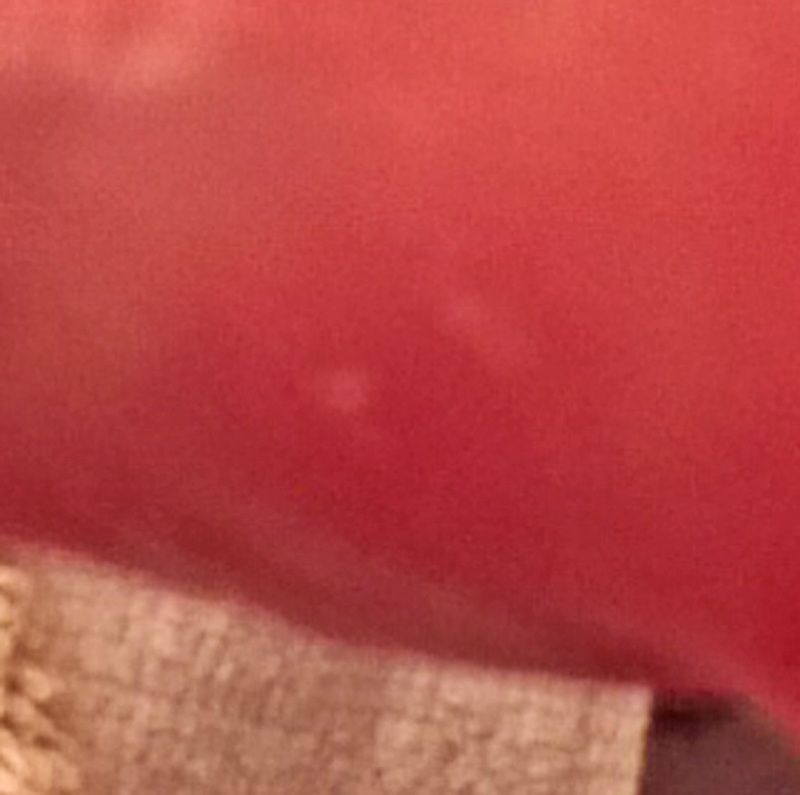 Note the pair of whitish spots on Margaret’s finger in the photo at left. the mark on the left is a pinpoint (suggesting the fang penetrated the skin a bit), while the one on the right is a dash (as if that fang grazed the skin but didn’t puncture the skin). Darryl took this photo just before calling me, and though some minor swelling can be seen, it’s nothing like what would be expected of a serious bite from a cottonmouth. Darryl preserved the snake (Margaret killed it soon after the bite occurred) in alcohol, and is sending it, along with the cotton glove she was wearing at the time, to me for analysis in the lab. As soon as these arrive additional photos will be taken under the microscope and added to this web page report.Darryl took the photos shown here shortly after the snake was placed in the alcohol. Margaret got bit on her pinky finger by an 11-inch cottonmouth juvenile, and we are at Clear Lake Hospital. I had Darryl’s cell phone number, and called him as soon as the message came in. He explained that, after Margaret’s earlier experience with the cottonmouth snake, described above, she was extra careful when gardening and out in the yard. This afternoon, while tidying up the front porch, she noticed that a potted elephant ear plant had lost a few more leaves. The pot was elevated off the porch floor, on thin, spindly legs that she reasoned a snake would find nearly impossible to navigate, so it seemed safe to reach into the pot to pull out the dead leaves. 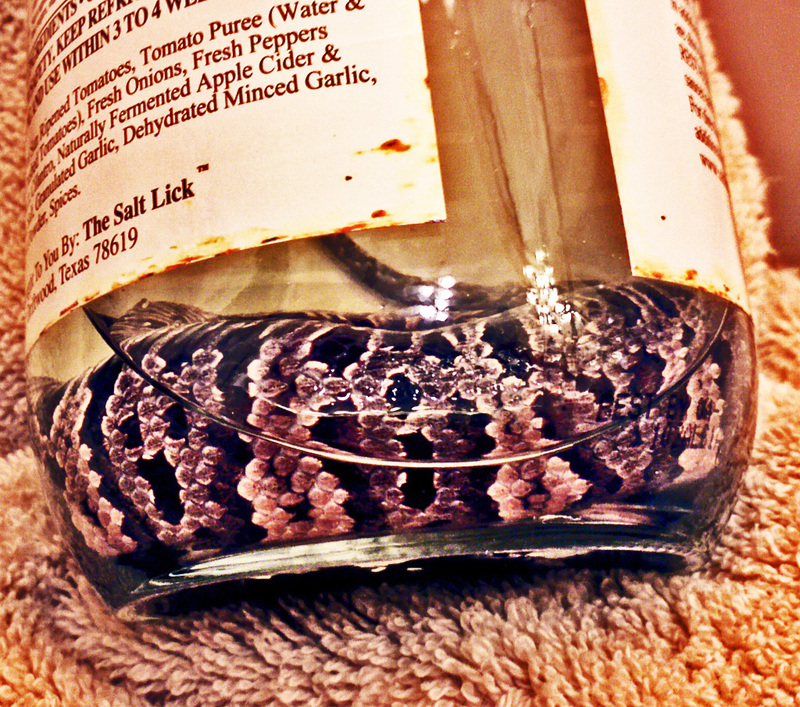 Wrong move… An 11-inch juvenile cottonmouth was in the pot, and bit her little finger. This time she wasn’t wearing any gloves, but — luckily — the fangs only nicked the skin, as before, with the earlier experience. Darryl is sending me photos of the potted plant, and the structure it is on. 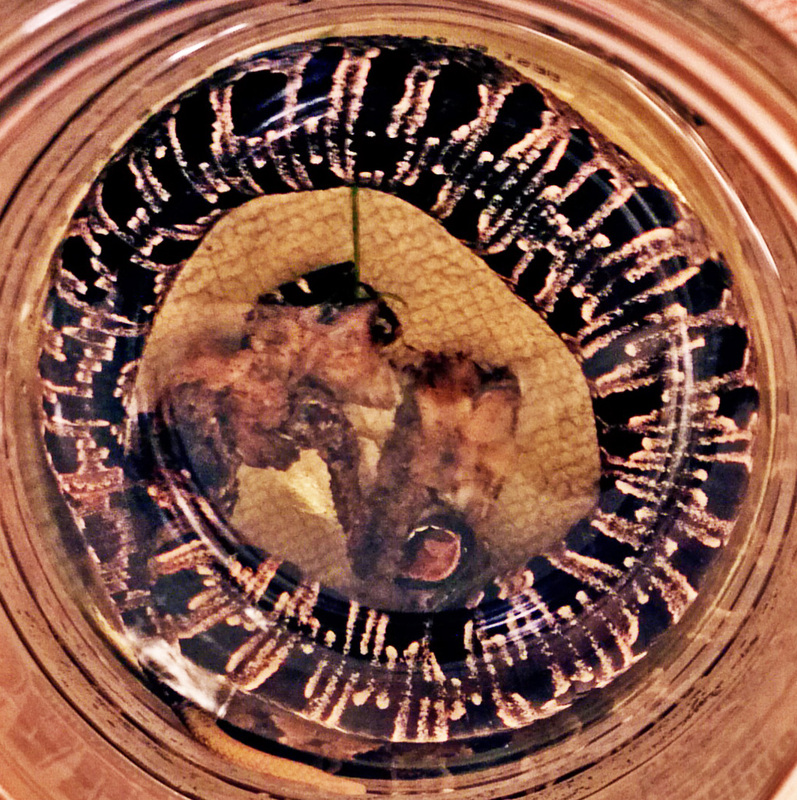 He also saved the (now dead) cottonmouth to send me with the earlier specimen, and this time the head is intact so it will be possible to do a thorough microscopic assay of the fangs, mouth, and head. Margaret’s finger is swollen slightly, but no more than before, so the doctors concluded she did not require a round of antivenin. His question almost floored me. I had been so engrossed in the biology of the snake that had bitten his wife just last week, that I’d neglected to have a detailed discussion with him about my articles on Snake Exclusion and PestAvoidance. And because we had not gone over that material together, his wife got bitten again, by another snake, possibly from the same litter that the earlier specimen had come from. One of my many projects involves developing granular and liquid habitat modifiers capable of producing an environment that doesn’t attract or nurture pests, including snakes, scorpions, insects, and spiders. These products are described on another website of mine. Along with those products, that website also explains the related concepts of Habitat Modification and PestAvoidance. (2) Snake Repellents — How, and How Well, do They Work? After reading through each of these pages, Darryl should have a good idea about the ways he can rid his yard of the snakes that are troubling his family. But we won’t let it rest there. He and I, along with Margaret, will be working closely together to ensure all the right steps are taken to deal with this problem. And we’ll report on it right here, as those steps are carried out. Notice items (5) and (6). These are the granular and liquid products I’ve been developing to take the habitat modification concept forward. They are not pesticides, repellents, or pest mitigants. Instead of killing, repelling, or mitigating pests, they simply produce an environment that doesn’t attract or nurture pests and — in the process — create PestAvoidance zones that are virtually pest free. And it isn’t a pipe dream. It works well, and we have several years of laboratory and field testing to prove it, including two years of field testing with some of the nastiest pests known to man (specifically, snakes and scorpions). Marketing is still in its infancy (I’m an investigator, not a salesman), but we’re gaining ground on that despite my lack of sales acumen. Same with product warehousing, shipping, and the infrastructure that goes with all that. If you want any of these products right now, you’ll have to deal with me directly rather than ordering on-line the way it should be done. Sorry. That’s just the way it is. But we’re moving forward, and my expectations are that in a few more months we’ll be out of the woods on all the little odds and ends involved in getting these things produced and marketed the way the big boys do it. In the meantime… well, just try to bear with me. Taxonomy: See my article on a mature specimen of this species for taxonomical information. Anatomy: Cottonmouths and copperheads are in the same genus (Agkistrodon) and the juveniles of both have sulfur-yellow tail-tips. The juveniles position the tips of their tails up in the air, over their heads, and wave them to lure frogs and insects to their locations so they can prey on them. As these snakes age, they become capable of hunting down prey, and the need for the yellow tail lure diminishes. Accordingly, their tails darken until, when they reach a length of 18-24 inches, most if not all of the yellow coloration is lost. Distinguishing Characteristics: Markings on the body of the juvenile cottonmouth are much more pronounced than on mature specimens. The markings consist of broad well-defined crossbands of grayish brown, dark brown, or black, each of which is lighter in its center, dark edged, and sometimes narrowly edged in white on its jagged outer margins, especially along the sides. One authority (Werler and Dixon, 2000) points out that some juvenile cottonmouths are altogether patternless, being solid black or solid dark brown; such cottonmouths are found most frequently along the Gulf Coast populations. That same authority also reports that the newborn cottonmouth bears little resemblance to its parents, but for the first year of life looks remarkably like a young copperhead. Distribution: Three subspecies are recognized within the species we now call the Cottonmouth (Agkistrodon piscivorus). These are (1) the eastern cottonmouth (A. p. piscivorus), which is the type species described by Lacépède and the largest of the three; it is found in southestern Virginia, the Atlantic Coastal Plain, and the lower Piedmont of North and South Carolina and coastal Georgia; (2) the Florida cottonmouth (A. p. conanti), a medium-sized snake found in southern Georgia and Florida; and (3) the western cottonmouth (A. p. leucostoma), the smallest of the three, found in southern Alabama, along the Gulf coast and offshore islands of that coast, to southeastern and central Texas, north to Oklahoma, Missouri, Illinois, and Indiana. Our specimen, the western cottonmouth, was first described by Gerald Troost, in 1836. Troost, an American-Dutch naturalist, constructed the subspecies name, leucostoma, using the Greek words λευκος (leukos = white) + στομα (stoma = mouth) as a reference to the bright-white coloration of the interior of the snake’s oral cavity. Zamudio, Kelly R., et al., 2000. Fang tip spread, puncture distance, and suction for snake bite. Toxicon 38 (2000) 723 – 72.